“I got that hate in my heart,” raps Scott Free on the furious chorus of “How I Live,” his latest single from his new EP of the same name. He’s not lying: he’s as mean as he needs to be to navigate the treacherous streets of Miami, and determined to get his, no matter the obstacle. 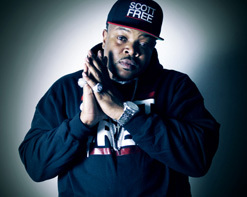 Originally breaking onto the scene as a part of Rick Ross’s Maybach Music Group under the handle Scotty Boi, he’s got a wealth of success under his belt, and now he’s rebranding himself with the same fury and talent that his driven his entire career. Although you’d never want to be on his bad side, there’s a lot more to the rapper than mere ruthlessness. Compassion cohabitates with malice in that heart of his – as his deft rhymes and beautifully-shot videos demonstrate, he’s got love for his crew, his girl, the finer things that money can bring, and, above all, the city he calls home. All of that is on display in the glittering, troubling, subtly smart clip for “How I Live.” Here we’re shown the two distinct sides to the big city: the face it shows the world, and the one that only its inhabitants know. Scott Free begins the video in a great steel and glass towers that symbolize the wealth and international commerce. But the business of his day brings him to the seedier precincts of the city – neighborhoods that are as rough and destitute as those any in any major city, and only a short ride from the Downtown. It’s a testament to Scott Free’s mastery of the video form that he manages to make the cool, impersonal (and strangely depopulated) apartment blocks of rich Miami seem even more menacing than the streetcorners of Little Haiti. This isn’t the first arresting clip that Scott Free has starred in. The rapper, whose production and delivery pull equally from trap music and classic hip-hop, is on a video winning streak that stretches back into 2016. Just a few months ago, he gave the world the incendiary “Black,” a sharp, polemical video that confronted police brutality head-on, and paid tribute to young Americans who’ve fallen victim to the overreach of the authorities. (He’s also shot several outrageously entertaining clips that show off his expensive taste in cars and jewelry.) “How I Live” doesn’t make its message quite as explicit as “Black” does, but it’s hard to miss the implications of what Scott Free shows us: haves and have-nots, and the never-ending, corrupting struggle of those on the bottom, chasing the dollar at all costs. In one indelible shot, Scott Free rides a glass elevator in a sleek modern tower. With the lights of the building all around him, he stands alone and raps toward the camera. The elevator keeps going down, and down, further and further, with the ground nowhere in sight. It’s a huge privilege to get to work with Scott Free and the Mklaren Records crew to bring you this ferocious new clip. Please get in touch with us here at HIP Video Promo to let us know what we can do to help get this video into your programming. Contact Andy Gesner and the HIP Video Promo crew at (732)-613-1779, email us at info@HIPVideoPromo.com or visit www.Twitter.com/ScottFreeVMG for more info on Scott Free.